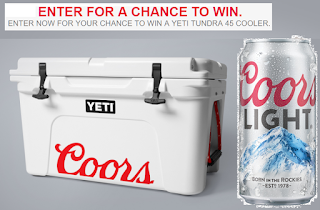 YETI Tundra 45 Cooler Giveaway - 30 Winners Each Win a $300 Yeti Tundra Cooler. Daily Entry, Ends 6/30/18. Open In The Following States Only: Arkansas, Iowa, Illinois, Kansas, Kentucky, Minnesota, Missouri, Nebraska, North Dakota, Ohio, Oklahoma, South Dakota, Tennessee, and Wisconsin. GOOD LUCK!! Prizes ( 30 per Entry Period): The prize is a YETI Tundra 45 cooler (all specifications to be selected by Sponsor in its sole and absolute discretion) (“Prize”). 30) total Prizes will be available in the Sweepstakes, thirty (30) per Entry Period. The Approximate Retail Value (“ARV”) of each Prize is $325.